We want to fuel a technology service revolution which advocates for the pursuit of delivering high-quality service and meaningful results. We believe in high-quality, environmentally friendly, socially conscious products, services and technology repair solutions. We believe in helping people understand their technology and overcome technophobias; to inform, educate and assist others with all aspects of their technology. 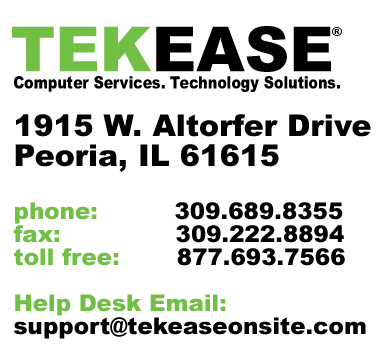 From our inception, TEKEASE has provided an alternative to the prevailing big-box computer stores and unqualified independents. We have all observed the rise and fall of these big-box brands due to low-quality, low-service and low-cost methods of operation. TEKEASE promotes a high-quality, high-service ethic. Our technical training and approach to resolving technology problems with consistency is unsurpassed. Should You Affiliate with Us or Buy A Computer Repair Franchise? There is power and safety in numbers! While franchising has proven to be an excellent expansion model for some types of businesses, it simply doesn’t work well in technology. Implementing technology well, or producing expected results for clients isn’t as simple as making a burger. TEKEASE is not a franchise computer repair business and it never will be. We carefully considered the franchise business model, but discovered franchise computer repair operations don’t scale well. Most importantly, we determined franchising was simply inconsistent with our primary mission. Franchisees are often led down the primrose path to endless debt, frustration and often disappointment. The community of TEKEASE affiliates constitutes an association of highly qualified technology practitioners dedicated to delivering consistent and predictable technology solutions under the TEKEASE name. Affiliates work in a collaborative working environment. Affiliates rely on and lean on each other, not corporate. The fact is, most people go into business on their own to become the boss…not to have a new one. Today, our affiliates see ourselves as part of a multi-front industry war. The war has many opponents: the low-quality big-box stores, the manufacturers which pander to big-box brands, and that millions of independents who operate with no standards, no insurance, no training. TEKEASE has revolutionized the idea of delivering high-quality, high-service technology solutions without the high cost of purchasing a franchise or association with some buying group which provides nothing more than a list of vendors. TEKEASE affiliation is an internet-based, grassroots movement started by TEKEASE (“techies”) who want to own their own local TEKEASE operation to support their client’s and communities. It is a call to those techies who want to make technology easy for consumers and small business owners alike. Getting started is easy, write us an essay (application), license a name, set up a website, send us photos of your operation and you will become part of a new community of TEKEASE affiliates. Affiliation with TEKEASE is easy. Complete the Request for Affiliate Information form below. Once accepted you will receive official notification and your TEKEASE Affiliate Badge. There are currently three TEKEASE Affiliate Levels. Affiliation levels are based upon the method of business operation the Affiliate engages in. TEKEASE Affiliates are independent business owners and licensees of the TEKEASE brand name. The annual fee to Affiliate with TEKEASE ranges from $3000 to $15,000 per Affiliate location. Access to TEKEASE Training and Certification Programs. Affiliate Network to Support Marketing Efforts. Ability to grow your professional network with other affiliates to share knowledge. A successful TEKEASE affiliate is operated by someone who loves technology and thrilling people. They must be goal and role-oriented and tenacious. The TEKEASE affiliate operates their own computer repair business, their own way. We provide the TEKEASE training programs to give the affiliate knowledge of TEKEASE methods. The TEKEASE affiliate program is designed for experienced technology professionals. Unlike a computer repair franchise system, we are not a no experience required program. Only affiliates committed to being involved in the program on a day to day basis will be considered. While TEKEASE provides certified affiliate training, the affiliate should come with some technical background. This information is not intended as an offer to sell or the solicitation of an offer to buy a franchise. It is for informational purposes only.